This is a single user license, allowing one specific user access to the product. The product is in Powerpoint format. This is a 1-5 user licence, allowing up to five users have access to the product. The product is in Powerpoint format. This is an enterprise license, allowing all employees within your organization access to the product. The product is in Powerpoint format. 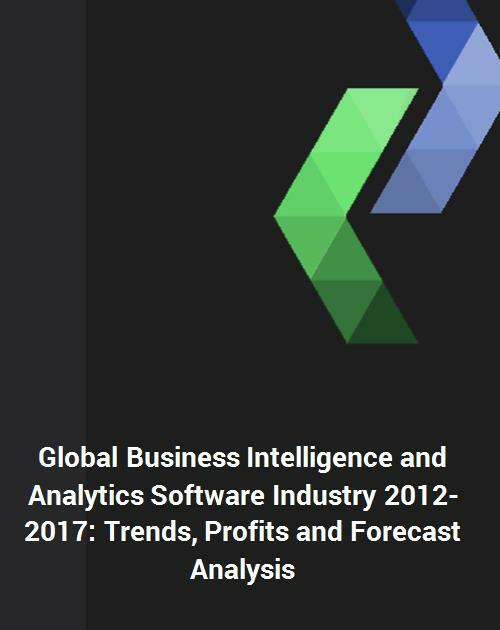 The global business intelligence and analytics software industry is anticipated to reach US $19 billion by 2017, sustaining a CAGR of 7.7% over the next five years. The industry is expected to witness exponential increases in organizational information and increasing competition in the new emerging markets. Business intelligence and analytics software is effectively used for cost cutting and bringing transparency to organizations. The report studies vendors of business intelligence and analytics, providing an annual trend analysis that highlights market size, profit, and cost structure for North America, Europe, Asia Pacific, and the Rest of the World regions. The industry has experienced rapid change as the dynamic macroeconomic scenario, increasing competition, and new emerging markets have proven tough challenges for the enterprises, which have made them take better strategic and operational decisions. The global economic crisis also has posed a threat to the software industry. This report also focuses on the key drivers for the industry. Emerging markets in the developed economies had driven the enterprises to build effective, agile decision support systems to meet the competitive challenges. The emergence of big data and rapid change in business markets has motivated enterprises to adopt business intelligence tools to sustain their positions in the industry. The study provides up-to-date information on the market share, profit margins, and capabilities of the leaders. The report helps current suppliers realistically assess their strategies vis-a-vis leading competitors and benefits executives with strategically essential competitor information, data analysis, and insight, critical to the development and implementation of effective marketing and sales plans. This comprehensive guide provides readers with valuable information and the tools needed to successfully drive critical business decisions with a thorough understanding of the market's potential. This report will save clients hundreds of hours in personal research time on a global market and it offers significant benefits in expanding business opportunities throughout the global business intelligence and analytics software industry analysis. In a fastpaced ever-changing world, business leaders need every advantage available to them in a timely manner to drive change in the market and to stay ahead of their competition. This report provides business leaders with a keen advantage in this regard by making them aware of emerging trends and demand requirements on an annual basis. The report is in PowerPoint format and has hundreds of critical data and market insights that will help in effective decision-making. This study is intended for senior level executives, sales, marketing and business development professionals at various nodes of value chain of this market. This multi-client market study is used by small to multi-national Fortune 500 companies and utilized for a variety of reasons as follows.